Quite a few modern Soto Zen teachers seem to not believe in the traditional Buddhist idea of rebirth. Are modern Rinzai Zen teachers the same way? Or do most Rinzai Zen teachers have more traditional views about rebirth? Re: Rinzai views on rebirth? rebirth is happening every single moment. Every single moment of life is the wheel of birth and death. If you don't understand the meaning of that, then speculation about what might happen before or after your physical birth and death is meaningless. I think the reason that everyone is so fascinated by rebirth is because they think it is something that pertains to them personally. But it really isn't. It is a completely impersonal process. The modern world is so fixated on the individual ego that it can only understand it in terms of 'me being reborn'. "Where will I be? What will I be?' I don't think rebirth means that at all. The Buddha warns against that kind of thinking. It is better just not to speculate about such ideas and admit we really don't know. That is not necessarily scepticism or saying 'there is no rebirth'. But trying to understand it through working it out is an impossibility. That is my interpretation. Whether that is what Rinzai Zen would teach, I don't know, but I think it is something like that. jeeprs wrote: That is my interpretation. Whether that is what Rinzai Zen would teach, I don't know, but I think it is something like that. Have you ever been the student of a Rinzai roshi? jeeprs wrote: rebirth is happening every single moment. Every single moment of life is the wheel of birth and death. I am well aware of the fact that my body and mind are continually changing. jeeprs wrote: I think the reason that everyone is so fascinated by rebirth is because they think it is something that pertains to them personally. But it really isn't. It is a completely impersonal process. The modern world is so fixated on the individual ego that it can only understand it in terms of 'me being reborn'. Well, if you focus on moment-to-moment rebirth, then the question "is there a next life?" is no more or less ego-centered than the question "What will I be 5 minutes from now?" Anyway, everyone has their own opinions and there are plenty of rebirth debate threads already, but in this thread, I am just interested in the views of the Rinzai school. So if people have never received teachings from a Rinzai roshi, then they should at least quote traditional Rinzai texts. Pure speculation just clouds the issue. Cool. Thanks for the link! So this quote seems to imply that at least the old Rinazi masters had a fairly traditional Buddhist view of karma and rebirth. But I guess it still remains to be seen if lots of modern Rinzai teachers are going down the Brad Warner/Stephen Bachelor path of making lots of noise about not believing in traditional Buddhist ideas about karma and rebirth. I know one Rinzai Roshi, whose view on rebirth is very traditional. Luke wrote: So this quote seems to imply that at least the old Rinazi masters had a fairly traditional Buddhist view of karma and rebirth. I agree witb Bachelor's critics in regard to his views on re-birth. I think if you dispense with the notion of re-birth, what is left can't really be considered Buddhism. It might be a modern secular Western philosophy based on Buddhism, and that might be a good thing. But it definitely ought not to be marketed as 'the real dharma', because it isn't. That's what I really don't like about his approach. If he didn't make 'so much noise' about it, I wouldn't have much of a problem with it. jeeprs wrote: I agree witb Bachelor's critics in regard to his views on re-birth. I think if you dispense with the notion of re-birth, what is left can't really be considered Buddhism. It might be a modern secular Western philosophy based on Buddhism, and that might be a good thing. But it definitely ought not to be marketed as 'the real dharma', because it isn't. That's what I really don't like about his approach. If he didn't make 'so much noise' about it, I wouldn't have much of a problem with it. Yes, I agree. I don't want to be affiliated with a Buddhist group that dismisses karma and rebirth. That's why I am trying to find out which traditions subscribe to those views, so I can avoid them. Luke wrote: Yes, I agree. I don't want to be affiliated with a Buddhist group that dismisses karma and rebirth. That's why I am trying to find out which traditions subscribe to those views, so I can avoid them. Don't worry: no Buddhist tradition dismisses karma and rebirth. A few contemporary teachers do. The easiest solution is simply to avoid those teachers and work instead with those who teach the traditional Dharma. "the majority of Zen practitioners and teachers in the West are agnostic on this subject, leaning one way or the other. I, for instance, am agnostic on the subject, but lean toward nonbelief…"
"It is not taught any place in the sutras that we will have a next life; these six realms are not something that we will experience when we are reborn in another life. They could apply to different parts of society; they could apply to different aspects of our current life; they could apply to our various states of mind." "Whenever I've had the opportunity, I've asked the Zen masters I've encountered about rebirth. My first teacher, Sochu Roshi, said, "It's a nice story." I asked another teacher, Eido Roshi, about the same thing and he thought for a moment then he said, "It's better to say, 'Could be' than to say, 'No.'" When I asked Maezumi Roshi about it, he never answered me except with thunderous silence. Nonetheless, I overheard heard him telling others, "Yes, definitely, there's rebirth!" Rather than talk about it, they wanted me to find out for myself." "Another fundamental principle of Buddhism is the doctrine of the continuity of life and death. There is no sharp dividing line between this life and the next. ... Death does not disturb the continuity of life; for karma and rebirth are continuous, the one implying and being inseparable from the other. As sin and suffering bring death, so does death bring rebirth." "The Chan and Zen views of Rebirth are not the same. These schools make no assumptions or hold beliefs as to what happens after one dies. Because of this, rebirth is seen as being born into each moment, dying and being reborn into the next moment. This isn't something to be taken on faith, but to understood through your own practice." Luke wrote: But I guess it still remains to be seen if lots of modern Rinzai teachers are going down the Brad Warner/Stephen Bachelor path of making lots of noise about not believing in traditional Buddhist ideas about karma and rebirth. To start, there aren't a lot of modern Rinzai teachers anywhere (meaning those who were named as successors and lineage holders by their teachers, i.e. they received inka shomei). The ones I've known, both Japanese and western, did not negate it at all. Rinzai Zen is Buddhadharma. But one assumes that rebirth teachings, like any other, are to be employed in appropriate circumstances. Answers given by various teachers might well have been appropriate for the listeners present then: a person fixated on a concept of substantial self might find the carpet pulled out from under him/her ("When you die you'll disappear completely"), while someone fearful and lacking confidence regarding their ability to practice might be encouraged not to worry because "if you don't get it in this life, you'll continue in the next existence". These are two answers I witnessed coming from the same teacher. So short answer: Rinzai Zen is Buddhadharma, but the focus of Rinzai practice is what it considers the essence of Buddhadharma, the recognition and integration of one's nature - which is not bound by Buddhadharma or any other teaching. Resolving that, nothing remains unresolved...and so teachings of rebirth or any other teaching will be (hopefully) employed skillfully to support the student's practice. A Rinzai teacher's job is to bring about that recognition, and guide the student along the path of integration which follows. As far as the means used or set aside, nothing is a sacred cow and ultimately there is no fixed method. Of course I describe the ideal situation, in which a teacher is deeply realized and the student has sufficient capacity. I am not saying every teacher is deeply realized. We know that not every student is suited to this approach. Research well to choose your teacher and path wisely. 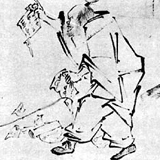 Finally, another possible source of confusion is that the classical model of Rinzai practice stresses that it is crucial to examine and grasp the purport of the sutras, but typically not until an advanced stage of practice, and then primarily for the purpose of checking one's experience to see that it tallies with them. Of course in the past, students coming to a Zen teacher would already have had some training in basic Buddhist teachings. But in the west today folks from all kinds of backgrounds, mostly Abrahamic in terms of early religious training, come walking in. Added to this is the fact that a large percentage of them, having been so well educated on "what Buddhism is" by way of popular books and online forums, are fairly certain they already "get it". The end result: lots of self-defined Zennies with a small amount of actual Zen experience who think something like, "Zen rejects traditional Buddhist teachings and ignores rebirth. When I went to the Rinzai place, we didn't read anything. They just taught me a basic practice and told me to do it for a couple of hours a day as a foundation. When I asked about rebirth and karma they just told me to keep counting my breaths". At our place here we have a regular study group examining basic texts and teachings, to try and fill in this background which new students often lack. Thank you for your excellent reply, Meido (Meido Roshi?). Probably is, how many people do you know who have the name "Meido..."? I agree. Secular Buddhists tend to think they are uncovering an original Buddhism. As someone who professes a sort of secular Buddhism, or simply a Buddhist philosophy without so much doctrine and dogma, I have to disagree. I engage in what you may call "secular Buddhism", and I highly doubt rebirth as Buddhists traditionally put it, but I don't pretend that it's the same as regular ol' Buddhism or religious Buddhism. Whether or not it's the "original Buddhism" as Batchelor seems to imply is of no interest to me. How Buddhist philosophy helps me live a good life and strive for spiritual experience and unity is what matters. "Nothing can be known, not even this."